From the first, telescopes have made dramatic revelations about the Universe and our place in it. Galileo's observations of the Moon's cratered surface and discovery of Jupiter's four big satellites profoundly altered the perception of the heavens. Over the past century, the rapid development of computer technology and sophisticated materials allowed enormous strides in the construction of telescopes. Modern telescopes range from large Earth-based optical telescopes and radio arrays linking up across continents, to space-based telescopes capturing the Universe in infrared, ultraviolet, X-rays, and gamma rays. 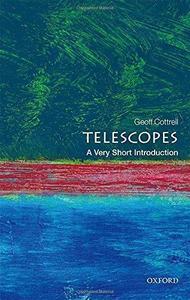 In combination, they have enabled us to look deep into the Universe and far back in time, capturing phenomena from galactic collisions to the formation of stars and planetary systems, and mapping the faint glow remaining from the Big Bang.In this Very Short Introduction, Geoffrey Cottrell describes the basic physics of telescopes, the challenges of overcoming turbulence and distortion from the Earth's atmosphere, and the special techniques used to capture X-rays and gamma rays in space telescopes. He explains the crucial developments in detectors and spectrographs that have enabled the high resolution achieved by modern telescopes, and the hopes for the new generation of telescopes currently being built across the world. ABOUT THE SERIES: The Very Short Introductions series from Oxford University Press contains hundreds of titles in almost every subject area. These pocket-sized books are the perfect way to get ahead in a new subject quickly. Our expert authors combine facts, analysis, perspective, new ideas, and enthusiasm to make interesting and challenging topics highly readable.